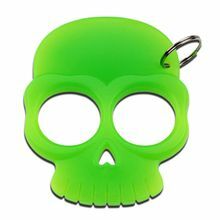 Glow in the Dark (or under UV light) plastic knuckle keychain. Provides some self defense from attack on your keychain. Fingers through eye holes and you have a menacing hard surface to strike with.